Gazpacho is a famous chilled Spanish soup, although it's more like a drink really. 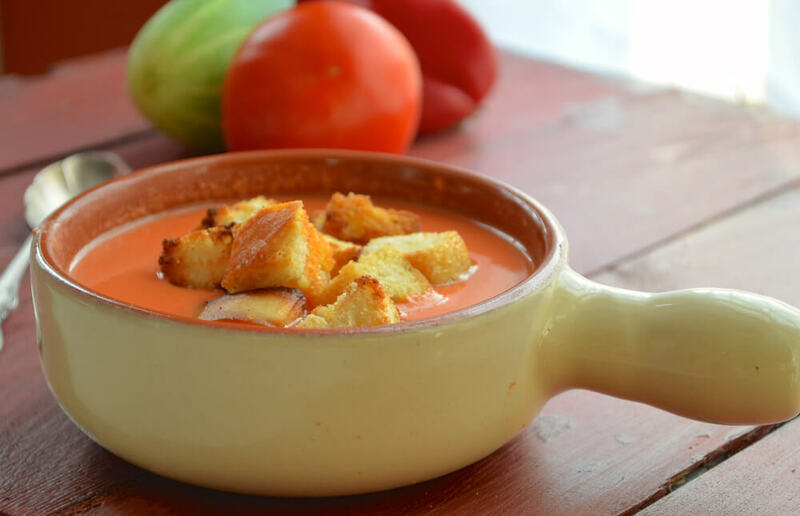 This authentic Spanish gazpacho recipe comes from Seville, Spain. This authentic recipe is bread-free and creamy pink-orange in hue. This soup should be served as cold as possible. You can even serve it over ice. Gazpacho makes a nice cool, refreshing treat during the hot summer months. Prepare it the day before and chill it overnight if you can. 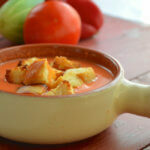 There are different ways to make gazpacho, but it's always better to make your own rather than buying a packet or can. The following recipe is super-easy to make and it tastes so fresh and good. 1. Put the cucumber, tomatoes, garlic, onion and pepper in a blender. 2. Blend for at least 2 minutes at high speed, or until smooth. 3. You might need to do this in batches. 4. Use a spatula to occasionally scrape down the sides of the blender jar. 5. Keep the motor running and add the salt and vinegar. 6. Drizzle in the oil. 7. Is the soup watery? Add some more oil if so - you want to get it creamy. 8. Strain the soup through a strainer and discard any solids. 9. Put the soup in a glass pitcher and chill for at least 6 hours or until very cold. 10. You can add more salt and/or vinegar before serving if necessary. 11. If the soup is too thick, add a little ice water. 12. Serve in glasses, perhaps over ice. 13. Drizzle a little olive oil on top if liked.